Only two games were completed in the Lincolshire ECB Premier League as rain spread northwards across the county. Bracebridge Heath picked up 20 points to increase their lead at the top of the table while Alford edged closer to safety at the bottom. Paul Cook hit 70 and Kit Spence 53 as Louth bowled the leaders out for 239 with an over to go but were then skittled out for 70, Joe Price taking five for 38. Rikki Bovey also took five wickets as Grimsby were all out for 140, a total Alford reached for the loss of seven wickets. 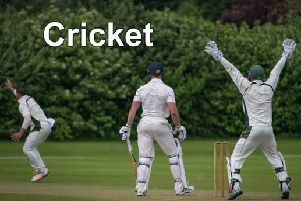 The most exciting game was at Market Deeping, with Lindum needing one wicket to win and Deeping needing five runs when rain washed out the game. After the visitors had reached 78 for two, Sachinthra Perera took five wickets for 27 to help bowl them out for 105. Aaron Onyon - newly returned to the side - and Will Wright then reduced the home side to 44 for seven before Perera and Mehul Adatia took the total to 70. The ninth wicket fell on 81, leaving Adatia and Ross Lowndes with the task of putting on 25 for the last wicket. The pair stuck to their task but with the score on 101 torrential rain swept the ground and no further play was possible. Woodhall Spa’s game against Bourne was halted after the first innings with the home side 196 for nine, Harsha Vithana hitting 83 And Grantham made 201 for seven in their innings, Mat Dowman with 59 and James Dobson 66 not out. Sleaford’s reply had reached 24 for two when rain stopped play. Scunthorpe Town versus Boston was washed out completely as rain waterlogged the pitch. Results: Bracebridge Heath 239 (Spence 53, Cook 70), Louth 70 (Price 5-38); Grimsby Town 140 (Bovey 5-44). Alford 144-7; Grantham 201-7 (Dowman 59, Dobson 66no), Sleaford 24-2 – abandoned; Lindum 105 (Perera 5-27), Market Deeping 101-9 (Onyon 5-42) – abandoned; Woodhall Spa 196-9 (Vithana 83) v Bourne – abandoned; Scunthorpe Town v Boston – cancelled, waterlogged pitch.